Home / Eat, Drink and Raise Money for WRHA! Raise some dough just by raising your fork! You can help support the cats and dogs in our care at Wanderers’ Rest Humane Association. 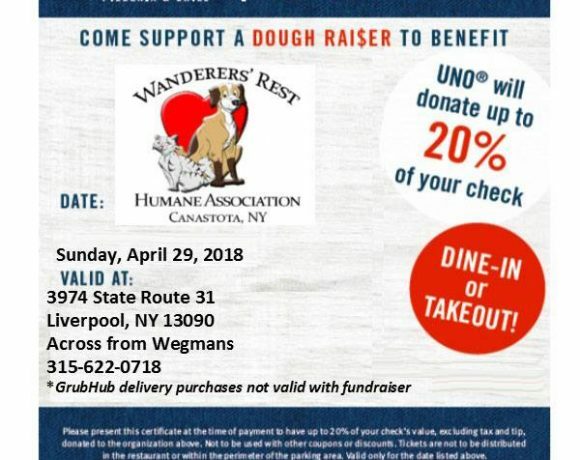 On Sunday April 29th, Wanderers’ Rest will be hosting a ‘Dough Raiser’ at Uno’s Pizzeria & Grill in Liverpool, NY. Up to 20% of your eat-in or take-out bill will be donated back to WRHA! *Please remember to BRING YOUR VOUCHER and tell your server you’d like to support Wanderers’ Rest! We look forward to seeing you there.. and thank you, so much for your support! 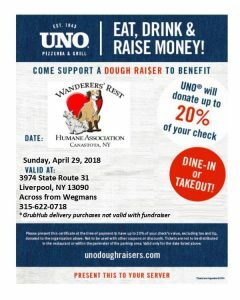 Print the coupon below… and bring your friends – Pass out coupons – Ever order helps!